No, the hummer was not our rental vehicle. 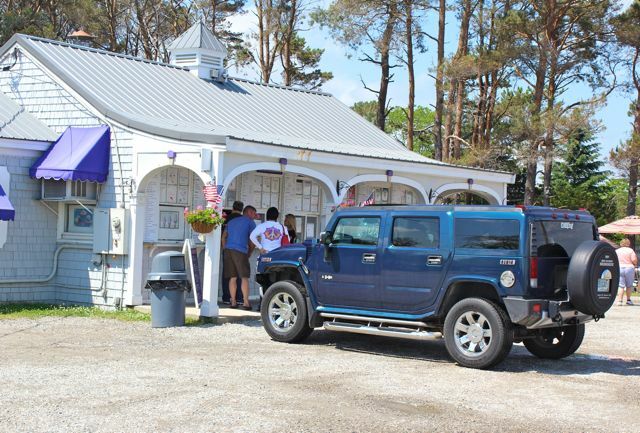 :) We parked, got out of the car, and despite the extensive menu, had been advised beforehand that the must-haves were definitely the lobster roll and the lobster bisque. We didn’t opt for the foot long lobster roll at $35 or so, so we had the smaller on for about $17 or so. A bowl of lobster bisque was also ordered along with a bottle of water and a soda. I think our bill came close to $40. A few minutes later our ordered was called and I claimed a large bowl of bisque and a lobster roll overflowing with lobster. The roll was slathered with a bit of butter and toasted and the amount of filling was a bit overwhelming. I could have brought another 2 hotdog buns and spread out the lobster to feed a couple more folks. It was very, very good. 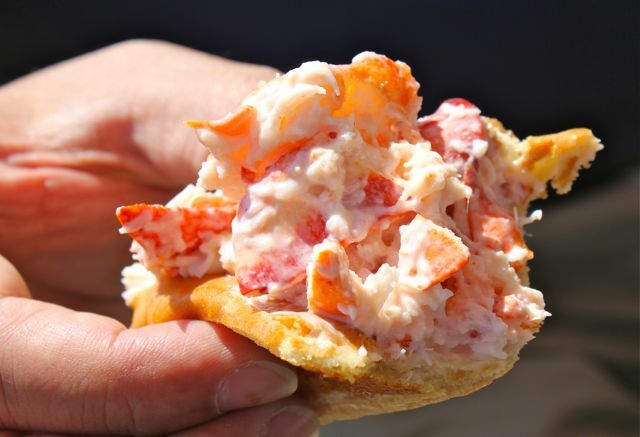 Unlike some lobster rolls where the mayonnaise is just used as a topping, here it was all mixed in. But you can see from the photos that the lobster meat is the star, with the mayo just taking the supporting role. The bisque, which appeared a bit nuclear orange at first, was to DIE FOR. 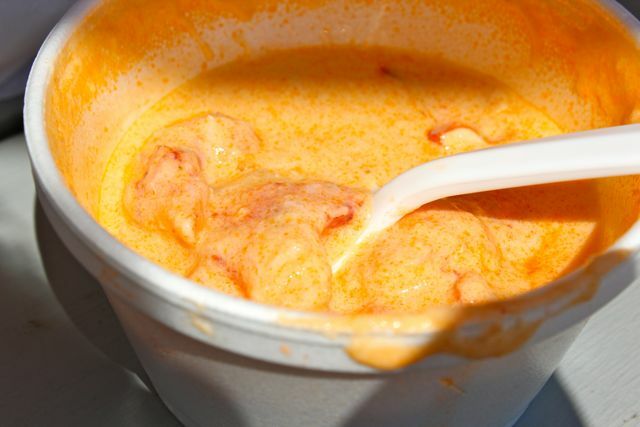 Humongous chunks of lobster, a hot creamy and flavorful broth. It was perfect while sitting out on picnic tables with a slightly cool breeze coming off the ocean. And let’s not forget one snapshot of the goofy garden statues… :) The simple verdict? Totally worth the drive, totally worth the money. Trim it down and specialise. I wish I could tag along with you on your seafood hunting expeditions in New England. hello mm! i’m not really a huge fan of lobster (along with crabs and shrimps) but i need to say, your photos are really good. please say hello to “the teen.” i recall reading about her birthday celebrations when she used to be tagged as “the kid….” wow, ang bilis lang. First pic is the gastric juice inducer. Lobster Cantonese..a synonym for YUM! @Footloose – LOL! You hit it right on the head. I remember travelling with the family of one of my friends to Las Vegas and they brought their rice cooker so that they can have rice and to cook some soup in after a night of gambling. And this is after several admonitions (not taken) that buffets are cheap in Vegas. LOVE lobster rolls. There’s a strip mall restaurant here in the SF Peninsula called “Lobster Shack”. 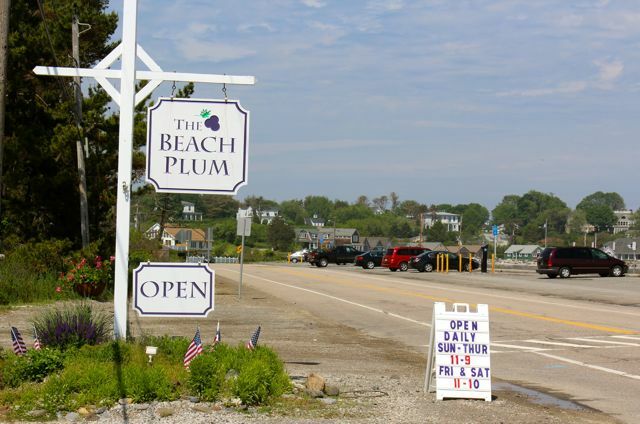 They have their Maine lobsters flown in regularly. I am a huge fan. I like my lobster rolls “naked”, meaning only lobster meat and drawn butter… I think Lobster Shack here charges $37 for two rolls. The bisque is also very good. 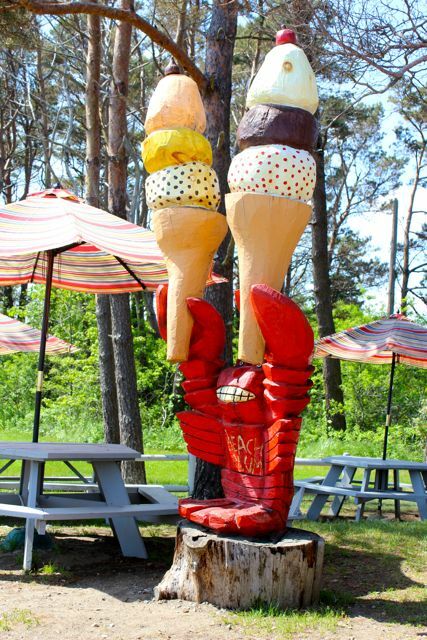 One of these days I’m gonna go to New England for a lobster pilgrimage. lol. @Khew re too much choice. At the best of times, truly trying to stand behind an indecisive clod slowly vacillating between the 31 flavors of Baskin Robins just to end up asking for vanilla. In this heat, it can drive you homicidal. Mm, would you know where else in maila lobster roll is offered outside lusso? I haven’t spotted it anywhere else but there. One more to add to my bucket list!! (of course, the places in my bucket list are really flights of fancy from the armchair) but, thank you, always, MM, for sharing your	journey with us. 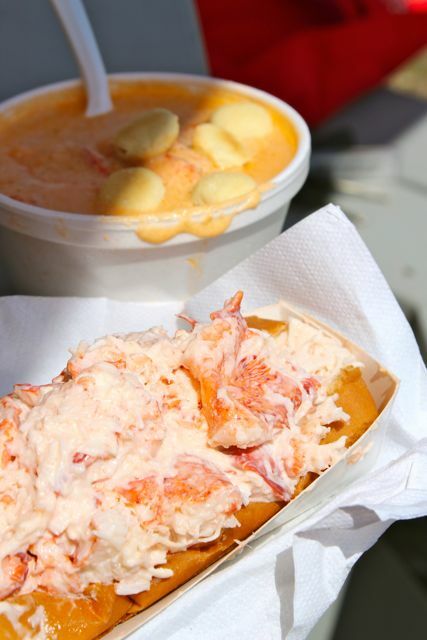 Suddenly paying 18.00 for a lobster roll at the local food truck doesn’t sound so bad. If I had this lobster roll, I would buy a few more loaves of bread and make extra sandwiches to “stretch” the experience. I recall buying a McDonald’s Sausage McMuffin with cheese and buying extra pandesal to make two or three more. JJ, odd question, but no, I don’t.